*I asked my daughter from Hello It’s Hannah, who is heading into her sophomore year of college if she would share a little of what she learned her first year. If your child is about to start their freshman year, I hope they’ll find these tips/advice helpful! Hello there, friends. So I just finished my first year of college, and saying it was a rollercoaster is an understatement. I experienced intense stress, heartbreak, confusion, doubt, and countless other things. With all of that said, however, it was an amazing year, mistakes and all. 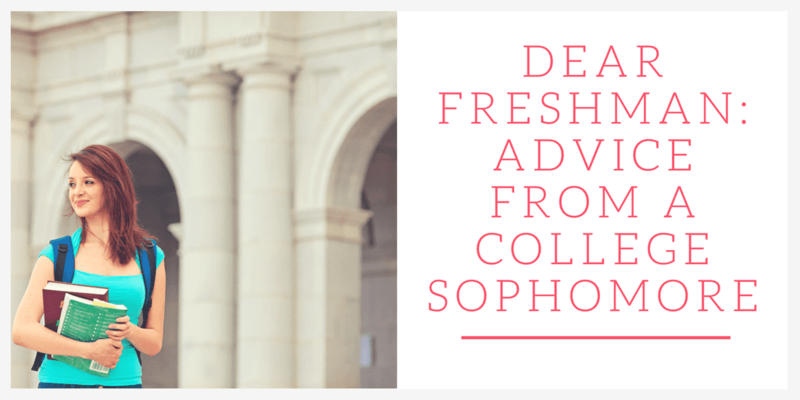 Throughout this year, I’ve learned several things I wish I knew when I’d started college, and I’m here today to share them with all of you incoming college freshman who is probably excited and terrified all at once. For a good chunk of people, high school was easy peasy in terms of class difficulty. You could get an A or B without much work. This is absolutely not the case in college. Class is 95% percent lecture, and 5% review, and that’s usually the day before the test. It is up to you to make sure you understand the material because there won’t be a whole lot of time for asking questions in class. If you really do have questions about the material, go to the professor’s office hours! They will absolutely help you. That’s what office hours are for. One of the best things I did in college was utilize tutoring and learning labs. A lot of colleges have students in the class who have taken the class and gotten an A, and these students hold sessions for kids to come in and ask questions about the material. A lot of schools also have math or writing labs. Please use these resources! They don’t cost anything, and they are there purely to help you. If your school doesn’t have either of these things, start a study group. Those are also incredibly useful. In fact, I was in a group once for French class, and someone in that group told me that our final was just over one chapter and not over the entire semester. I would have studied for days and been so burnt out had I not known that. You might not be besties with your roommate. Believe it or not, it’s actually pretty rare for roommates to become close friends. Most roommates just go about their everyday lives, hardly even talking to each other. If that’s the case, don’t worry. Just introduce yourself and ask a few questions about their major and things like that. If you don’t hit it off, that’s okay. However, if you are a few weeks into the semester and you are having serious issues with your roommate, talk to your RA or Hall Director about the situation. Be calm and clear about the problems you’re having. Find an extracurricular or two that you like. The best thing about my freshman year was finding two organizations that I fit into really well. I made so many friends, especially towards the end of this year, and because of these clubs, I’m excited about going back to school instead of dreading it. Find one or two clubs or activities you really enjoy at your school, and stick to them. During freshman orientation, there will probably be a club or activities fair set up with all of the organizations at the school. Go! It sounds exhausting (and it kind of is), but you’re bound to find something you like and it’ll set you up for an awesome first year. You will probably change your major. If you find yourself halfway into the year and your major is just not working for you, that’s perfectly normal. It’ll take some time and some adjusting to find out what you really want to do, and there will be people all along the way to help you out. So if you do want to change your major, don’t panic. It’s more common than you might think. Focus on your education first. College is incredibly exciting, and there are so many new things happening. You’ll meet new friends, find extracurriculars you like, and maybe you’ll meet someone special. In the midst of all of this, however, it’s important that your education takes precedence over social activities. If you’re invited to go out with friends and you have a biology test the next day you haven’t studied for, let your friends know that you really need to study and that you’ll hang out with them that weekend or something. It may seem boring now, but you’ll thank yourself later for focusing on school first. Even if attendance isn’t required (yes, that does exist), go anyway. You are paying for these classes and you don’t want to waste opportunity and money by skipping class. With all that said, if you are really and truly sick and you have to miss class, that’s another story, School is important, but health takes precedence over all. Visit the clinic on campus or go to another doctor if there isn’t. Also, email your professor if you know you’ll be absent. This shows initiative and that you care about the class. They’ll remember that later. I hope all of the advice helps you through your first year of college! College is your first time being on your own, and although it comes with a lot of responsibility, you’ll learn so much about yourself and what you want out of life. Have fun! I love this! Reminds etc of the quote: “be the person you needed when you were younger”. Thanks for sharing your great advise! This post is on point. I stayed at a local college for my first two years, but transferred to a school a couple of hours away from my hometown last year and I can really relate with basically everything she is saying. A great point about telling your friends “No” about going when you need to study for a test is a great tip. During my first semester, my three roommates always wanted to go out, and I would end up going, and after a couple of not so hot test grades, I quit that really fast! Good luck in her sophomore year!